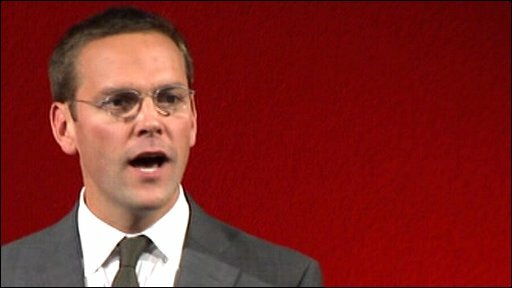 News Corporation's James Murdoch has said that a "dominant" BBC threatens independent journalism in the UK. The chairman of the media giant in Europe, which owns the Times and Sun, also blamed the UK government for regulating the media "with relish". "The expansion of state-sponsored journalism is a threat to the plurality and independence of news provision," he told the Edinburgh Television Festival. The scope of the BBC's activities and ambitions was "chilling", he added. Organisations like the BBC, funded by the licence fee, as well as Channel 4 and Ofcom, made it harder for other broadcasters to survive, he argued. "The BBC is dominant," Mr Murdoch said. "Other organisations might rise and fall but the BBC's income is guaranteed and growing." News Corporation, which is the largest shareholder in BSkyB, lost $3.4bn (£2bn) in the year to the end of June, which his father, News Corporation boss Rupert Murdoch, said had been "the most difficult in recent history". Other media organisations are also struggling as advertising revenues have dropped during the downturn. Sir Michael Lyons, chairman of the BBC Trust, told the BBC's World Tonight that Mr Murdoch had underplayed the importance of Sky as a competitor. "Sky continues to grow and get stronger and stronger all the time so this is not quite a set of minnows and a great big BBC," Sir Michael said. "The BBC has a very strong competitor in Sky, and not one to be ignored." Mr Murdoch said free news on the web provided by the BBC made it "incredibly difficult" for private news organisations to ask people to pay for their news. "It is essential for the future of independent digital journalism that a fair price can be charged for news to people who value it," he said. News Corporation has said it will start charging online customers for news content across all its websites. Former BBC director general Greg Dyke said Mr Murdoch's argument that the BBC was a "threat" to independent journalism was "fundamentally wrong". He told BBC Radio 5 live: "Journalism is going through a very difficult time - not only in this country but every country in the world - because newspapers, radio and television in the commercial world are all having a very rough time." He said declining advertising revenues in the recession, rather than the corporation, were to blame for the problems facing the commercial media. "That is nothing to do with the BBC, that is just to with what's happening," he said. News Corporation owns the Times, the Sunday Times and Sun newspapers and pay TV provider BSkyB in the UK and the New York Post and Wall Street Journal in the US. Rupert Murdoch addressed the same festival 20 years ago, and was also critical of the UK's media policy.